Paramount Financial specializes in equipment leasing and financing for businesses nationwide, offering a fast and simple solution for companies acquiring new and used equipment. Our industry experts work with small and large companies alike to approve financing programs that meet the specific needs of our clients. 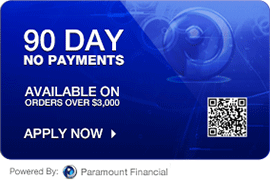 PayPal Credit is a line of credit that gives you the flexibility to pay for your purchase now, or pay over time. It’s easy to apply and easy to use. Select PayPal Credit as your payment choice during checkout. You’ll be asked to provide your date of birth and the last 4 digits of your Social Security number, and then to agree to the terms and conditions, to apply for a PayPal Credit account. You’ll know within seconds if you are approved. And here’s the cool thing: link your PayPal Credit account to your PayPal account and you’ll see it as a payment option when you checkout with PayPal. ACG Equipment Finance LLC to offer our valued customers a quick financing solutions of capital equipment purchases costing as low as $3000 up to $100,000 ! We look forward to working with you and are always available to discuss any opportunities.